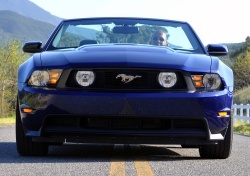 With the 2010 Mustang GT, Ford had a great all-around performance package. The tire burning acceleration was there – along with fantastic handling, braking, and steering. All of this was wrapped up in one great looking – newly updated for 2010 – retro body styling. The same body styling that we all love is back for a second year however there’s a lot more horsepower raging under the hood this year. These are very good times for Mustang and even muscle car fans. It’s sure a lot better than the mid-1980s when Ford was planning on replacing the Mustang with the front-wheel drive Probe. Fortunately Ford listened to the Mustang fans and the Mustang is still alive and better than ever while the Probe has long been extinct. The Mustang’s obituary has been written many times in the past by many automotive writers and critics however this car soldiers on getting stronger as the years progress. The Mustang’s nickname should be “unbreakable”. For all intents and purposes the Mustang should have died after Ford had its run with the Pinto based Mustang II from 1974 to 1978 which almost single handily destroyed the Mustang’s past performance reputation. I realize that the times were lean back then for performance however when the Mustang – Ford’s performance flagship – at best could only muster a paltry 134 net horsepower from a 2-bbl 302 CID V8. GM and Chrysler were at least trying with some of their performance cars during this time having as much as a little over 200 horsepower. Ford could have at least thrown on a 4-bbl carburetor on the 302 during the Mustang II era to at least show they were trying, but it was not meant to be. Where GM had lost horsepower at least it was tweaking handling on its performance cars, so buyers had something to look forward to. With the Mustang II, even on the so called performance editions, 13 inch diameter wheels were mandatory – even Tony Alva’s skateboard at the time had bigger wheels. Fortunately Ford in 1982 snapped out of this performance malaise, with the return of the Mustang GT which had been gone since 1969. For 1982 the new GT had (for the times) a powerful 157 horsepower 5.0 HO 2-bbl V8 – after nine long years of no real Mustang performance offered, Mustang fans were glad to have it back. Since 1982 the GT has been steadily improving to what is now in 2011 the fastest mass production Mustang to ever hit the market. 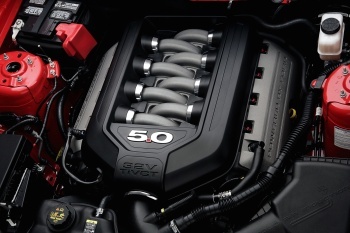 The power behind the 2011 Mustang GT is a new 5.0 liter V8. The “5.0” moniker is a familiar to any Mustang fan. In the past “5.0” meant a 2-valve per cylinder pushrod 302 CID V8 which is part of the Ford Windsor small-block V8 family. This V8 family spanned four decades from the 1960s to the 1990s. Interesting to note the 302 V8 really was 4.9 liters, but Ford rounded up to 5.0. – easy to remember number. Ford’s modular SOHC and DOHC V8 put the Windsor V8 family into permanent retirement. Though Ford’s SOHC and DOHC V8s have kept the Mustang in the performance running the last fifteen years, the old 5.0 liter has been missed. This time around the new 5.0 liter V8 is more state-of-the-art – we’re talking an aluminum block, DOHC design, 4 valves per cylinder (32 valves), and twin independent variable cam timing (Ti-VCT). Make no bones about it, this engine may sound like a muscle car from the past, however it’s one of the most technologically advanced V8s currently on the market – rivaling even the best from Europe. Let’s compare the Mustang GT’s new 5.0 liter V8 which has an output of 412 horsepower and 390 lb-ft of torque to the 2010 Mustang GT’s SOHC 4.6 liter V8 which produced 315 horsepower and 325 lb-ft of torque. Now that’s a big bump in power in one model year! One of the Mustang GT’s biggest past handicaps was it was a little short on the horsepower and torque when compared to the Chevrolet Camaro SS, Dodge Challenger R/T, and Dodge Challenger SRT8. Not anymore – not only does the Mustang have the horsepower to compete with these bigger pony cars, its lighter weight (a curb weight around 3,600 lbs) now gives it a very slight performance advantage over the Camaro SS – the GT now is capable of 12.8 seconds in the 1/4 mile with 0-60 mph now only taking a lightning quick 4.3 seconds versus the Camaro SS’s 13.0 second 1/4 mile and 4.6 second 0-60 mph times. This is really saying something when the current Camaro SS in terms of performance is the best it has ever been (see our 2011 Camaro SS review for comparison sake). However the verdict is still out on how the Mustang GT will compare to the mid-2011 release of the Challenger SRT8 which will debut with a 6.4 liter (392 CID) Hemi V8 rated at 470 horsepower. Initial tests are putting the Challenger SRT8 in the high-12 second 1/4 mile territory. The most amazing aspect of the GT’s new 5.0 liter V8 is how so much horsepower and torque output can be achieved with only five liters of displacement. There’s an old saying in muscle car circles that “there’s no substitute for cubic inches.” What this means is that real torque can only be had with large cubic inches. This rule has remained constant for many years with only turbos and superchargers being the exception since they can allow a lower displacement motor to have the torque of a much larger displacement motor. However in the Mustang GT’s 5.0 liter V8 case, it’s America’s first low displacement V8 (of around five liters) to have torque like a large displacement/big block V8 from the muscle car era. With 390 lb-ft of torque on tap that’s 90 lb-ft of torque more than the best previous best torque rating of 300 lb-ft of torque from the GT’s 5.0 liter V8 for the 1987-1992 model years. And let me tell you when you drive the new GT with the 5.0 liter V8, you feel the difference between the new 5.0 liter and last year’s 4.6 liter V8. The new 5.0 liter is the first non-supercharged Mustang in 40 years to have the same kick you in the back torque feeling of the big-block 429 and 428 CID V8 equipped Mustangs. In recent years the 4.6 liter SVT Cobra and 5.4 liter Shelby Mustangs have had this kind of big-block V8 torque feeling however it was a supercharger that made it possible. For some the whine of the supercharger does get annoying after spending a lot of time behind the wheel. That’s why it’s nice to have so much horsepower and torque available under the hood without a whiny supercharger to interfere with that good old American V8 sound under the hood. Usually a big jump in horsepower and torque means a slight drop in gas mileage – not in this case. The good news is that the GT’s horsepower and torque increase comes with improved gas mileage – the manual transmission equipped GT has mpg ratings of 17 city and 26 highway which easily beats last year’s manual equipped GT (16 city/24 highway). The automatic equipped 2011 Mustang GT has mpg ratings of 18 city and 25 highway (2010 automatic equipped GT was 17 city/23 highway). With all the extra horsepower/torque under the hood and improved gas mileage this year, this is certainly the rare case of being able to have your cake and eat it too. And it’s hard to believe but finally for 2011 a 6-speed manual transmission is now available – gone are the days of the 5-speed manual transmission. This is indeed long overdue Ford should have offered a 6-speed manual in the Mustang GT twenty years ago. The good news is that the long wait was worth it. The new 6-speed manual provides smooth and precise shifts – to say it’s leagues better than last year’s 5-speed would be a big understatement. And for those wanting an automatic transmission there’s also a new smooth 6-speed automatic that replaces last year’s 5-speed automatic. On the option list is a performance-oriented 3.73 rear axle ratio – this is worth every penny and a “must have” for any Mustang gear head who plans on using the car at the dragstrip – 3.55 is the standard rear axle ratio. One area where most new performance cars fall short is in under-the-hood aesthetics where most engines are covered up by lots of ugly plastic shrouding. With the 2011 Mustang GT one lift of the hood and it harkens back memories to the golden era of the muscle car when engines were made for performance and to look aesthetically beautiful. This is why it’s such a joy going to old muscle car shows to see all the distinctive beauty that resides under the hood of each of the many different muscle cars. The GT’s 5.0 liter V8 is very pleasing to the eye; the shrouding is kept to a very minimum with all the main engine parts visible – it’s the type of motor you will spend at least a few minutes looking over with a smile on your face upon first seeing it. A shiny chrome “5.0” badge resides on the engine providing a very nice touch. 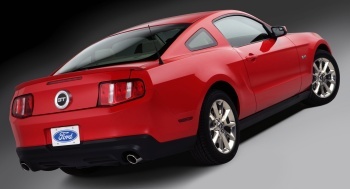 As mentioned before the awesome styling of last year’s Mustang GT carries over unchanged for 2011. Personally, I don’t think I’ll ever get tired of looking at this Mustang body style. I am still in awe how Ford engineers could have improved on the winning 2005-2009 body style, however they managed to do it with the current body style. In the areas of handling and braking fortunately the new Mustang GT does not copy the old 5.0 liter Mustang GT. Back in the 1980s and through the 1990s it was the performance GM f-bodies (Camaro/Firebird) that had the Mustang GT beat in handling and braking. GM during these years tended to have better tuned suspensions with meatier tires than the Mustang GT. GM also had 4-wheel disc brakes standard or optional during most of these years. The 1982-1993 GT unfortunately was crippled with mandatory rear drum brakes. Those days have long since passed, the new GT now stops on a dime and with the optional Brembo brake package – it stops noticeably better than the Camaro SS. Especially in this area of braking the Camaro’s seven year hiatus has put it behind the Mustang GT. The GT also with the optional Brembo brake package will out handle the Camaro SS pulling in skidpad number of .94 g versus the SS’s .92 g. This package includes electronic stability control (ESC) and front 14 inch and back 11 inch vented rotors with four piston calipers. However the real gem of this package is the beautiful set of 19 x 9.0 inch dark-stainless premium painted aluminum wheels which are subjectively the best looking wheels available on the GT. The very sticky P255/40R19 Pirelli PZero (summer-only) tires also help to keep these wheels planted to the pavement. If the Brembo brake package is not your cup of tea, there are a few other 18 and 19 inch wheel and tire combos available. The main reason why the GT for 2011 obtains such a high skidpad number is that all the goodies that were part of the 2010 GT’s optional “Track Pack” package are now standard on the 2011 GT. The GT comes in two body styles, the coupe (which is really a fastback) and the convertible. Ford has made sure that Mustang fans have been kept happy the last few years. Only one disappointment comes to mind – the lack of a retractable hardtop convertible option. Ford had toyed with the idea a few years back and the rumors were strong enough to suggest it was going to reach production, however the retractable hardtop convertible for the time being appears to be deader than a door nail. The interior is comfortable and very functional; the gauges are retro but not as retro as the Camaro, but they fully functional and pleasing to the eye. In fact in a lot of respects the interior is more functional than the Camaro. Two nifty features are the ability to change the backlight color to any of a large list of colors and the tachometer which flashes red when you hit redline territory. The driver seating position is near perfect – the seats and surroundings are very comfortable. The Mustang interior is a nice work of art, yet it’s extremely comfortable – you don’t mind be trapped for a few hours in stop-and-go traffic in this Mustang. The only annoyance is the rear side windows which are tough to see through which is typical of a sporty car like the Mustang. And when it comes to options – remember those old 5.0 liter Mustang GTs with the stripped down interiors with hand crank windows? Won’t find anything like that now on the Mustang GT. For the base price of a little over $30,000 ($30,495 to be exact) the GT comes pretty well equipped. Of course if you go crazy with the options you can bring the sticker price all the way up to $40,000 territory. Let’s for a moment forget about technical specifications and all the other gibberish most of these types of articles tend to talk about and let’s just focus on one simple thing. What makes a car, a great car? That’s an easy answer – one that’s so much fun to drive that after you drive it you can’t wait to drive it again. With the new 5.0 Mustang GT, it’s this type of fun car that you can’t wait to drive again. It’s the fastest Mustang GT yet, and by far it’s the most fun. Ford engineers really hit a grand slam home run with this car – this car is so good it’s going to be a tough act for them to follow.